According to your instruction I have translated into Japanese, and the translated text are shown correctly. But there is an issue. Language for "Houses" and "categories" must be selected "All" for Japanese, otherwise no objects will be displayed. My site is multilingual with German. For German pages I can select German for houses as well as categories. However if choose Japanese from the pull down menu for houses or categories, nothing but the titles are shown. And if I change the language from "Japanese" to "All", all the objects are displayed correctly. 2. In the file RealEstateManager.xml in the directory /administrator/components/com_realestatemanager/ add the language entry for your language. This goes right after the entry language/english.php. I thought there is a line - lang/english.php - in the file "realestatemanager.xml", but I don't see any. I hope you understand my problem and give me some tips or solution. so lang_code - must be exactly as use joomla for your lang, in this case for Dutch language and for dutch.php file !!! Thank you very much for a reply. 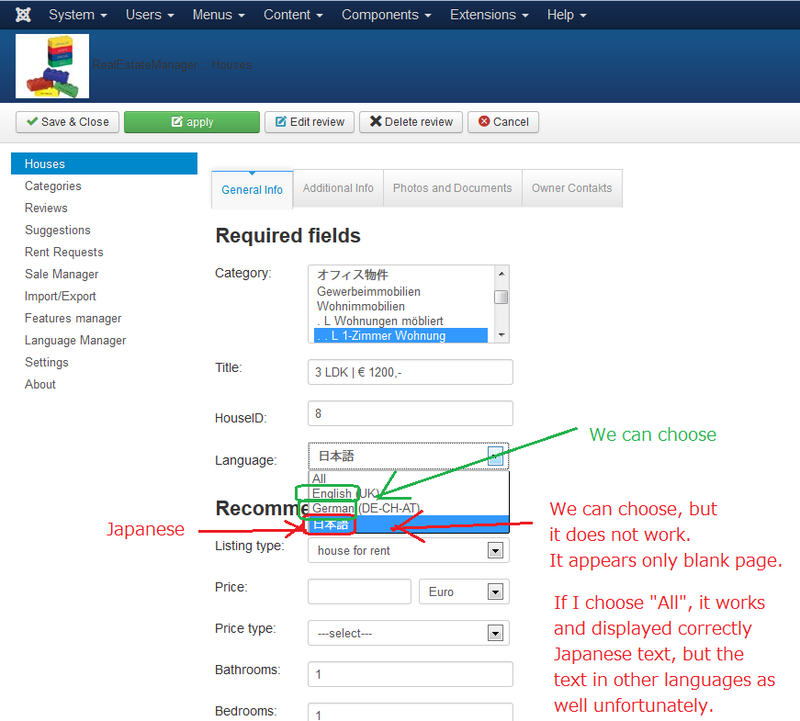 Yes, Japanese is set as a Joomla content language on the Joomla language manager. So, the basic multilingual functions work well. In fact, it works fine. It means that the Japanese pages as well as Japanese RealEstate properties are shown correctly in Japanese. However I have to choose "All" to display the pages. I hope you understand my problem. 2 or lang_code=>'ja-JP' not full exactly equal for code what you set in language content - in Joomla language manager or it not full equal to lang code - what set for your Japanese frontend lang file, may be it set as 'ja-jp' ?! If you will can fix that - please send admin and FTP access to your site and we will check where error. But how can I send you admin/access-password personally?